This is the last of the China Glaze, Cirque de Soleil that I have to show you. 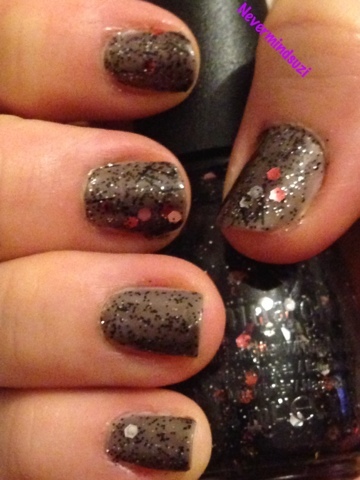 Get Carried Away is a black jelly with black and silver micro glitters, large red and silver hexes and again the dreaded black bar glitter. I quite like this but again would prefer it without the bar glitter. I've had problems with this, the bar glitter was spiking through my top coat on a couple of nails and some of the bigger red hex's left me with stains on removal, I had about six spots on my nails looking like they had measles!